Nigeria's President Umaru Yar'Adua has unveiled details of a 60-day amnesty for militants in the Niger Delta. Ministers of Nigeria's Council of State have approved the proposal - an effort to end years of attacks on the region's beleaguered oil industry. A presidential pardon, rehabilitation programme, education and training are being offered to militants taking part. The main militant group, which had been sceptical about the amnesty, has not yet commented on the offer. But one faction, the Niger Delta Vigilante Movement, has previously indicated it will take part in the programme. The president presented the proposal on Thursday after convening the Council of State - composed of the country's 36 governors, as well as former presidents and chief justices - in the capital Abuja. As the final details were being thrashed out, the Movement for the Emancipation of the Niger Delta (Mend) said it had carried out a pre-dawn attack on an oil pipeline owned by Royal Dutch Shell in Rivers State in the south of the country. 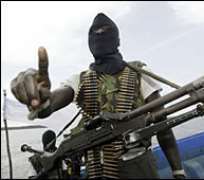 The militants said the attack, on the Billie/Krakama pipeline, was timed to coincide with Russian President Dmitry Medvedev's visit to Nigeria. "This is the fate that awaits the gas pipelines you plan to invest in [in] Nigeria if justice is not factored in the whole process," Mend said in a message to Mr Medvedev, sent in a media statement, reported AFP news agency. Energy investment deals worth billions of dollars were signed during Wednesday's meeting between President Yar'Adua and his Russian counterpart. The Nigerian leader told a news conference with Mr Medvedev: "I am hopeful and confident that by the end of this year, we will have a secure and stable environment in the Niger Delta." Militant attacks in the region have reduced oil production to 1.3m barrels per day. Nigeria's Opec quota is 2m. The BBC's Abdullahi Kaura Abubakar in the Niger Delta says the government hopes an amnesty can help bring lasting peace to the region. But he says the militants have been expressing fears about their safety and whether after the amnesty, they would be free to walk the streets without being killed by law enforcement agents. Barrister Ikenna Enekweizu, a lawyer representing militant leaders, said he had received assurances from federal government officials about his clients' safety. But he warned that the deal would collapse if these guarantees were not "concretised". It is not the first time the Nigerian government has offered an amnesty to militants, says our correspondent. Former President Olesegun Obasanjo also proposed one, but it did not succeed in ending the conflict.